Norfolk Southern’s profits grew 10% to $506 million or $1.75 per share, but Canadian National’s fell 1.4% to C$958 million or C$1.27. Norfolk Southern surpassed the Bloomberg News consensus forecast by 12 cents, but Canadian National fell a penny short. 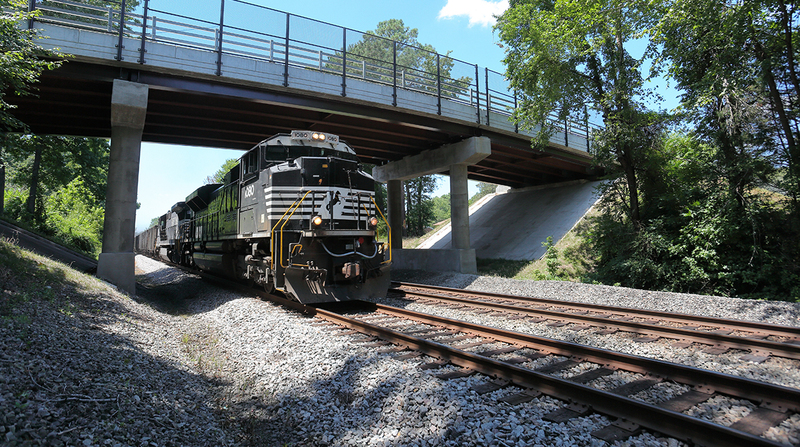 One year ago, Norfolk Southern generated $460 million in profits while Canadian National’s was $972 million. Meanwhile, Norfolk Southern’s chief rival, CSX Corp., announced that Chief Operating Officer Cindy Sanborn and its chief of sales and marketing, Fredrik Eliasson, have resigned effective Nov. 15. James Foote was hired to take over both Sanborn and Eliasson’s jobs, reconnecting with CEO Hunter Harrison after working together at Canadian National. “Jim’s proven track record with Precision Scheduled Railroading will be a significant asset as we continue to drive value for shareholders and customers,” Harrison said in a statement. • Norfolk Southern’s revenue grew 5.8% to $2.7 billion. The railroad carrier benefited from strong results in intermodal, coal and metal transportation, all of which have grown year-over-year in each quarter in 2017. Truck-rail freight revenue improved 8% to $621 million with a 4% gain in carloads to 1.03 million carloads and a 4% in revenue per carload to $600. Coal revenue surged 13% to $449 million, carloads jumped 12% to 266,600 and revenue per carload edged up 1% to $1,687. Third-quarter revenue in metal and construction freight transportation rose 12% to $378 million, carloads grew 4% to 194,200 and revenue per carload went up 8% to $1,945. Norfolk Southern likely benefited from the CSX service meltdown over the summer. Although many dissatisfied CSX shippers this summer were captive shippers — where no other railroads offer competition — those with choices shifted freight to Norfolk Southern on a spot basis, according to Cowen & Co. surveys. Industry analysts Ravi Shanker from Morgan Stanley and Jason Seidl from Cowen asked whether it boosted sales and would retain the business, but company executives didn’t provide specifics on the topic. The railroad carrier’s operating ratio improved 160 basis points to 65.9%. • Despite lower earnings, Canadian National’s revenue improved 6.9% to $3.2 billion. In fact, Canadian National’s income before taxes was actually $56 million higher than a year ago, but paid a 28.8% income tax in the quarter versus 24.6% last year. Canadian National’s intermodal operations provided some positive news in an otherwise lackluster report. Truck-rail revenue rose 12% to $827 million and a 20% increase in carloads to 671,000 more than making up for a 7% dip in revenue per carload to $1,232. Metals and minerals also contributed to the results with a 31% surge in revenue to $396 million, a 23% jump in carloads to 261,000 and a 7% increase in revenue per carload to $1,517. “CN delivered strong third-quarter financial results as we continued to see increased demand across key business segments such as frac sand, intermodal, coal and Canadian grain. I’m proud of what our team has accomplished given the strength and speed of the volume growth we’ve experienced this year,” CEO Luc Jobin said. Canadian National’s operating ratio deteriorated 140 basis points to 54.7%.